One of the best Force Fins is the Foil Force. Foil Force: features a patented up-curved blade that allows the energy from you natural kicking action of your legs to be transferred to the fin. As you kick up and down, the blade will snap back and send you forward as the blade recovers. This type of kick (power and recovery) is the most efficient kick. Compare your fins with the standard power down and weaker kick up. 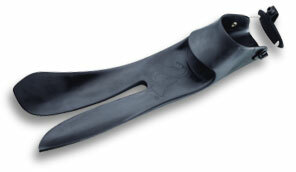 This fin's feature of placing your foot on top of the blade relieves the stress to your toes. It is this toes-free foot pocket that reduces the strain in your toes and thus reduces cramping. Now you can leverage the power of your legs by using your strongest kicking muscles. Because the fins have clean edges, this will reduce the turbulence in the water. The micro foil wings let the diver fine tune the position within the water column with small foot and leg movements. Check out our Force Fins Maintenance page for more information.